The “dog days of summer” take on a whole new meaning in Huntington Beach, as canines and their families flock to the stretch of shore between Goldenwest Street and Seashore Drive known as Dog Beach. Dog Beach is an off-leash doggie nirvana – lots of room to run in the open air, water to dive into, and plenty of other dogs to cavort with. If you don’t believe dogs can smile, visit Dog Beach and see for yourself! It’s pure joy on four legs. The stretch of beach below the coastal bluffs was long used informally by dog owners despite rules against dogs on the beach – and sometimes drew enforcement attention as a result. But thanks to a tireless campaign led by the late Martin Senat, Dog Beach was officially declared open to man’s best friend in 1997. 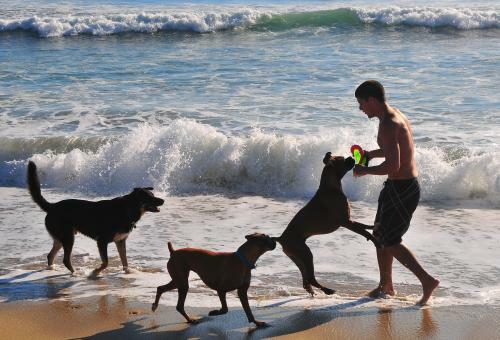 The Preservation Society for Huntington Dog Beach received non-profit status and was charged with helping to administer the beach that same year, said Alison Lavitt, the society’s CEO. The society creates and distributes information on Dog Beach, including the rules for dog owners, and provides free plastic bags to owners to clean up after their pets (which is Rule No 2). The society staffs a canopied information and gift booth at either end of the beach on weekends, that has flier and Dog Beach paraphernalia like sweatshirts and bumper stickers. The society also runs a volunteer program to maintain and clean the beach, Lavitt said. At the beginning, there were occasional incidents involving particularly rambunctious or poorly socialized pets, Lavitt acknowledged, but these have steadily declined and last year there were no incidents reported to lifeguards, she said. The beach averages about 5,000 visitors per weekend over the course of a year, Lavitt said, with more in the summer and fewer in the off-season. But weekend or weekday, it’s always possible to see dogs and their owners playing in the sand and the surf, with Frisbees, tennis balls or sticks flying into the water and happy canines plunging in after them. Other dogs play chase or race up the beach in small groups, leaping and yipping at each other as they revel in the freedom and fun of a day at the beach. 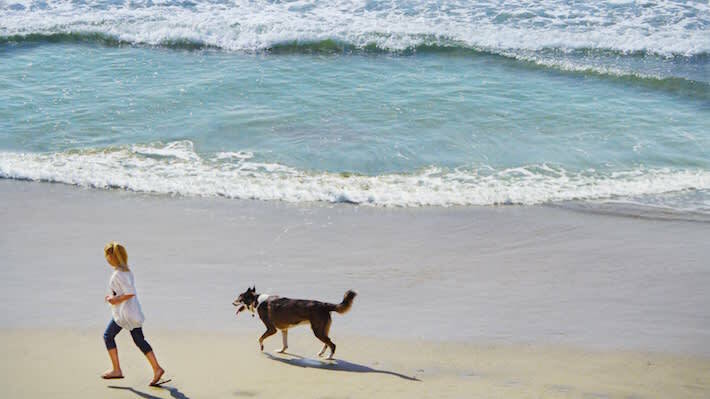 Huntington Beach is a winner of Dog Fancy magazine’s “Dogtown USA” award and been named one of Fido Friendly magazine’s Top 10 dog-friendly beaches in the nation. 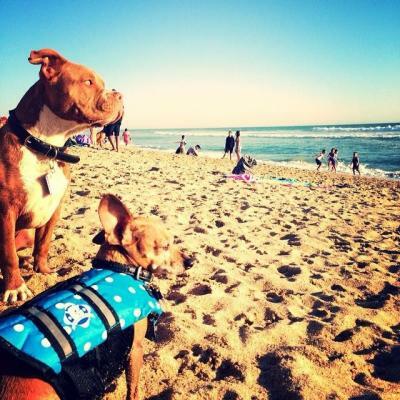 In addition to Dog Beach, the city features several other dog-friendly facilities, including restaurants and hotels. One such hotel, the Hilton Waterfront Resort, is a corporate sponsor of the society and offers an “It’s a Wonderful Dog’s Life” package deal that includes special gifts for guests and their pets upon arrival and other pet-related amenities. 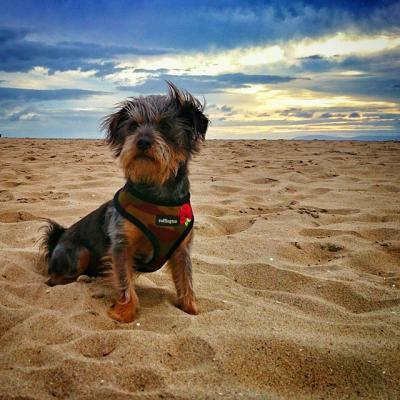 The Hyatt Regency Resort & Spa as well as the Shorebreak Hotel, Hotel Huntington Beach, and Extended Stay America are also pet-friendly Huntington Beach hotels. 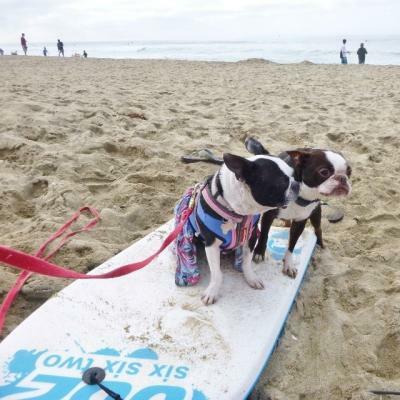 A special annual event at Dog Beach is the Surf City Surf Dog weekend in September, which features a canine fashion show and (only in Huntington Beach!) a dog surfing contest. 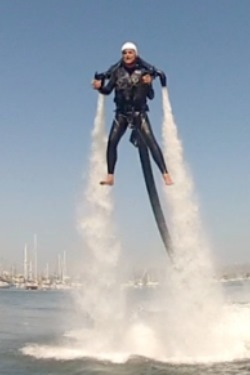 Check out some fun videos from this event here!